Uchida handbells are uniform in size which enhances their portability, playability and affordability without sacrificing their rich sound quality or accurate tuning. The concept surrounding these handbells is to make the experience of playing high quality bells accessible to as many people as possible. Uchida’s unique precision manufacturing method which was developed in Japan creates instruments that combine the excellent intonation and brilliant tone of high quality instruments with an affordability that opens up a world of possibility for music educators and ensemble directors. Anyone who wishes to enrich the musical life of their community with the unique quality of handbells will appreciate the Uchida handbells. 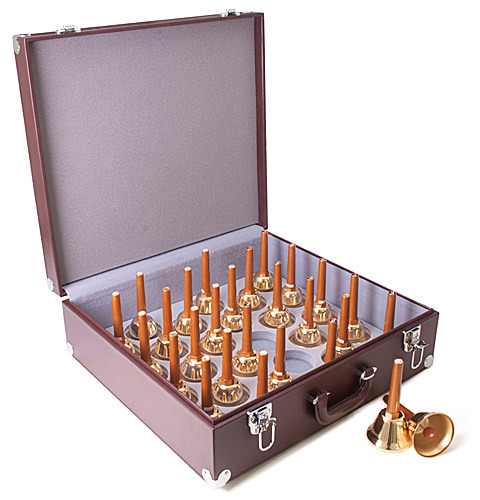 Our Premium Line Gold Model handbells are smaller and lighter allowing for greater portability and playability, with a bright and brilliant sound. Their light weight and small size makes them a joy to play for children or adults, novices or experienced bell ringers alike! Non graduated tuning for light weight and portability. Conductive to multiple playing techniques such as traditional ringing, harmonic stacking, martellato and Swiss style shaking. Their bright ringing sound has clarity and warmth.